Brenda Boykin is a fine blues and jazz singer who was born March 30th 1957 in Oakland, California and was working in San Francisco by the time I got to know her. The famous blues/jazz critic Lee Hilderbrand once wrote that Brenda had �the most authentic creative voice of this generation�. I�m sure we could all argue about that until the cows come home but I have enjoyed her music since hearing her first CD in 1997 on Blue Dot 102, which was named after the band she was working with, called �Home Cookin�, a second 'Home Cookin� CD on Blue Dot 103 �Afrobilly Soul Stew� issued in 2004 confirmed my interest. During this time I assumed that she was simply working as a blues singer in local clubs but, infact, she was also working and appearing at the San Francisco Blues Festival, The Monterey Jazz Festival and the DuMaurier Jazz Festival in Vancouver. Germany. A search on the Internet in 2005 revealed that she was now working with the Ulrich Rasch Jazz Quartet and had transformed from a good blues singer to an excellent jazz/blues singer. I contacted Ulrich Rasch with the idea of booking her together with the band for a Shakedown gig and was sent the bands demo CD which was outstanding and included wonderful �live� renditions of �Next Time You See Me�, �The Letter�, �House of The Rising Sun�, �Money�, and �Whole Lot Of Shakin�. That year saw her appearing at the Montreux Jazz Festival in Switzerland. After this the band fell apart and thoughts of a Shakedown gig faded. At some point after this she began working with the Nu-Jazz Project issuing CD�s on Chin Chin Records including her recent interesting solo album �Chocolate and Chili�. 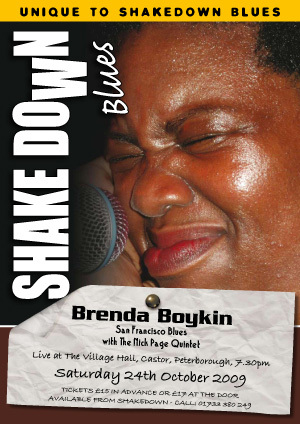 A copy of this arrived at about the time that I was booking Katherine Davis and the idea which had been floating in my mind for sometime of presenting blues singers with modern jazz bands solidified into a couple of 'When jazz & blues collide' shows - the second of which became Brenda's Shakedown gig. We then asked Nick Page to organise a blues orientated jazz quintet and he came up with the following amazing line-up: guitarist Nick Page a Barney Kessel / Kenny Burrel stylist; Colin Watkins on tenor sax played with amongst others 'Humph' and Walter Trout; Nick Hill trumpet and flugel horn � worked with Alan Skidmore and Gilad Atzmon; Russel Williams, Hammond organ played with everybody including the brothers Skidmore; John Scotney, drums who seems to have worked with anybody who is anybody including Mel Torme!